I had my eye on the CRKT Foresight for a while before I finally gave in and bought one. I had read almost universally favorable reviews on the Foresight, and it won the â€œImported Knife Of The Year Awardâ€ at Blade Show 2012. My buddy Ebbs loved his, as did the guy to whom he gave it to. All of the hype made the Foresight hard to resist, so how does it live up? The CRKT Foresight was designed by renowned knife maker and designer Ken Onion, and by my estimation, it’s a beautiful knife. It’s definitely in the class of “large folder” for me with an overall length of ~8.7 inches and a weight of 6.3 ounces. If you’re looking for something relatively small and lightweight for EDC, this is not the blade for you. The Foresight is a flipper design and uses the IKBS (Ikoma Korth Bearing System) that makes it feel more like an assisted opening knife. The flipper is a bit stiff (or at least mine is), but once it gets moving, the blade comes out with authority. I love the blade on the Foresight. It’s a broad, recurved blade with lots of belly, fairly large for a folder at 3.5 inches, and has a nice hollow grind. The spine has a bit of a swedge (false edge) at the tip that improves penetrating cuts, and also adds to the blade’s attractiveness for me. It’s made out of AUS8 steel and has a black Ti-Nitride finish. 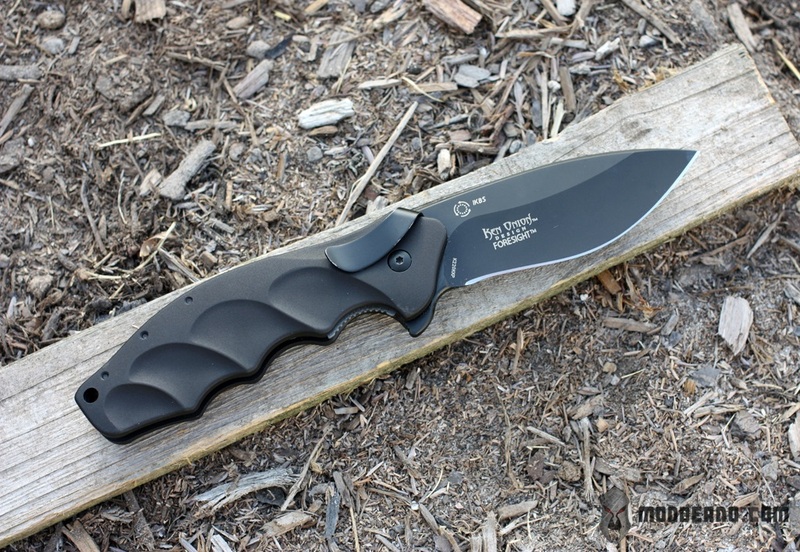 It comes with either a plain or partially serrated blade, and given this choice I always choose plain edge. Mine came pretty sharp out of the box and has been a great slicer due to the high hollow grind and .16 inchÂ blade thickness. Overall I think the blade is very well done. Pick up the Foresight, and if you’re anything like me, you’ll love the way it feels in your hand. The handle is made from matte black anodized aluminum, and is very ergonomic. 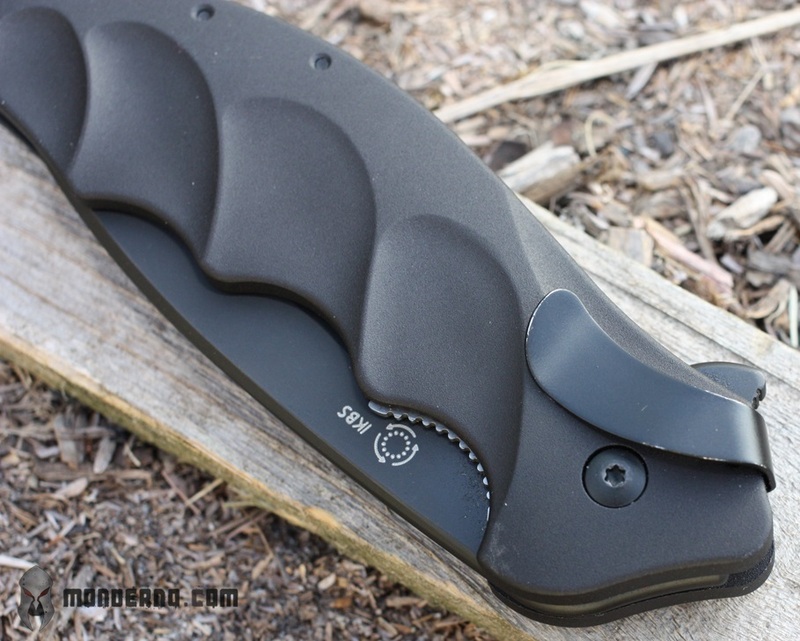 It has nice finger grooves that feel great, with a subtle thumb ramp that makes the knife feel mostly secure in hand. There isn’t any jimping on the spine of the blade or back of the handle, but oddly enough there is jimping on the locking leaf. I suppose Mr. Onion felt the thumb ramp was sufficient and jimping wasn’t needed. The aluminum handle does feel a bit slick at first, but the ergonomics do a good job of locking this knife into your hand. The Foresight is a liner lock design, and has a very solid lockup with no wiggle. As mentioned, there is jimping on the locking leaf which makes disengagement of the locking leaf easy with one hand. I have mixed feelings about the clip. First off, the clip is small and unobtrusive, which is great with the knife in hand. However, itÂ cannot be moved, which means you are forced to carry tip down. Tip down didn’t used to bother me much, but does more and more these days, to the point where I don’t really want to carry tip down anymore. Also, while the clip is small and unobtrusive, out of the box the clip was way too stiff, which made it hard to get the knife in and out of my pocket. I fixed this for the most part by slightly bending the clip outwards away from the handle, so that it wasn’t as tight against my pants pocket. Even with this change though, the knife is not very fast to deploy given the clip design and tip down carry. I think this knife would be better served with a slightly longer clip that is less stiff out of the box, that be swapped top to bottom or side to side. The CRKT Foresight is a pretty nice knife all things considered. It’s well made and I expect it to hold up well over time. If you can live with the clip and forced tip down carry, then you’ll probably love it. At the time of writing, theÂ you could buy the Foresight for around $80, which I think is a fair considering its features. So does it live up to the hype? Not completely in my book. But still, it’s a great knife that is very functional and capable, and I think most people will be very happy with it.Â I think that if CRKT/Ken Onion would address the shortcomings with the clip the Foresight would be nearly perfect. Man that is a bummer to hear about the clip, this knife was on my short list. Do you still recommend it all things considered? If you can live with tip down carry only, then yes. Nice review, Brandon. I have had my eye on this one for a while. Glad to hear you (mostly) enjoy it.